Tongariro National Park, established in 1887, was the first national park in New Zealand, and the fourth in the world. 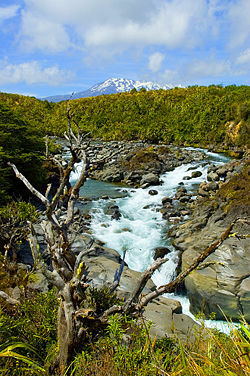 Located in the central North Island of New Zealand, the nearest towns are Turangi, National Park and Ohakune. The active volcanic mountains Ruapehu, Ngauruhoe, and Tongariro, located in the center of the park, have cultural and religious significance for the Māori people. In 1993 Tongariro became the first property to be inscribed on the UNESCO World Heritage List under the revised criteria describing cultural landscapes, and is one of the 25 mixed cultural and natural World Heritage Sites in the world. The park's active and extinct volcanoes, its diverse range of ecosystems and spectacular landscapes, along with its cultural and spiritual associations make it an important area not only to the Maori but all of New Zealand as well. Seven percent of country's electricity is produced by the Tongariro Power Scheme, which was designed to harness the power of water with minimal impact on the environment, preserving and protecting the natural surroundings. Tongariro National Park covers approximately 307 square miles (796 sq km) in the heart of the North Island of New Zealand. It is 205 miles (330 km) south of Auckland by road, and 199 miles (320 km) north of Wellington. It is a short distance from Lake Taupo. Directly to the east stand the hills of the Kaimanawa range. It contains a considerable part of the North Island Volcanic Plateau. The Park stretches around the massif of the three volcanoes; Mount Ruapehu, Mount Ngauruhoe, and Mount Tongariro. The Pihanga Scenic Reserve, containing Lake Rotopounamu, Mount Pihanga and Mount Kakaramea, though outside the main park area, is part of the park. On the park borders are the small towns of National Park Village and Ohakune. Further away are Turangi, Waiouru, and Raetihi. Within the park borders, the only settlements are the tourism-based village of Whakapapa and Iwikau Village, which is in a nearby ski-field and consists solely of ski accommodation. 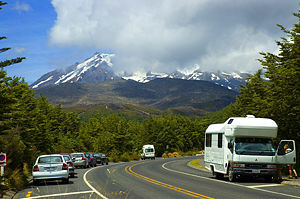 Tongariro National Park is surrounded by well-maintained roads that roughly follow the park borders and provide easy access. Like the whole of New Zealand, Tongariro National Park is situated in a temperate zone. The prevailing westerly winds gather water over the Tasman Sea. As the volcanoes of Tongariro National Park are the first significant elevations that these winds encounter on the North Island, besides Mount Taranaki, rain falls almost daily. The east-west rainfall differences are not as great as in the Southern Alps, because the three volcanoes do not belong to a greater mountain range, and the wind simply funnels over the summits. At Whakapapa Village (1119m) the average annual rainfall is about 2200 mm, in Ohakune (610m) about 1250 mm and in higher altitudes, such as Iwikau Village (1770m), about 4900 mm. In winter there is snow to about 1500 m. Temperatures vary dramatically, even within one day. In Whakapapa, they can fall below the freezing point all year round. The average temperature is 13 °C, with a maximum of 25 °C in summer and a minimum of -10 °C in winter. During some summers the summits of the three volcanoes are covered with snow; on top of Mount Ruapehu, snow fields can be found every summer and the summit is glaciated. The volcanoes Tongariro, Ngauruhoe and Ruapehu are the southern end of a 1,554 mile (2500 km) long range of volcanoes, below which the Indo-Australian Plate meets the Pacific Plate. These volcanoes have resulted from internal tectonic processes. The Pacific Plate subducts under the Indo-Australian plate, and subsequently melts due to the high temperatures of the aesthenosphere. This magma being less dense, rises to the surface and goes through the weak parts of the earth's crust (the faults) resulting in volcanic processes in the area. Volcanic processes have been causing the uplift of the mountains of Tongariro National Park for over two million years. Southern beech forest on the slopes of Mt. Ruapehu. The Tongariro National Park is a rough and partly unstable environment. To the north and west of the park, a podocarp-broadleaf rain forest near Lake Taupo stretches over an area of 12 sq miles (30 sq km), and up to an elevation of 3,280 feet (1000 m). In this rain forest live Hall's totara (Podocarpus hallii), kahikatea (Podocarpus dacrydioides), kamahi (Weinmannia racemosa), pahautea (Libocedrus bidwillii), and numerous epiphytic ferns, orchids, and fungi. Pahautea trees can be found further on up to a height of 5,020 feet (1530 m), where they cover nearly 50 square miles (129.5 sq km). On this level, one can also find a 19.5 sq mi (50 sq km) beech forest, containing red (Nothofagus fusca), silver (Nothofagus menziesii) and mountain beech (Nothofagus solandri var cliffortioides). There is also a 37 sq mi (95 sq km) area of scrubland, containing kanuka (Leptospermum ericoides), manuka (Leptospermum scoparium), celery-top pine (Phyllocladus aspleniifolius), inaka (Dracophyllum longifolium), woolly fringe moss (Rhacomitrium lanuginosum), small beeches and introduced heather. To the northwest, and around Mount Ruapehu, between an altitude of 3938 and 4921 feet (1200 and 1500 m), tussock shrubland and tussockland cover large areas (around 58 square miles, or 150 sq km), consisting mainly of New Zealand red tussock grass (Chionochloa rubra), inaka, curled leaved neinei (Dracophyllum recurvum), wire rush (Empodisma minus), and bog rush (Schoenus pauciflorus), as well as heather and grasses like hard tussock (Festuca novaezelandiae) and bluegrass (Poa colensoi). Above 4920 feet (1500 m), the terrain consists of gravel and stone fields and is accordingly unstable. Nevertheless, some plants occasionally settle there, such as curled leaved neinei, snow totara (Podocarpus nivalis), mountain snowberry (Gaultheria colensoi), bristle tussock (Rytidosperma setifolium), bluegrass and Raoulia albosericea, which cover an area of 64 square miles (165 sq km). Between 5577 and 6627 feet (1700 and 2020 m) there are some isolated parahebe species, Gentiana gellidifolia and buttercups. Above 7218 feet (2200 m) live only crustose lichens. Tongariro National Park is home to 56 significant species of birds, such as rare endemic species like the North Island brown kiwi, kākā, blue duck, North Island fernbird (Bowdleria punctata vealeae), double-banded plover (Charadrius bicinctus) and karearea. Other bird species common to the park are tui, New Zealand bellbird, southern boobook, grey warbler (Gerygone igata), fantail, and silvereye. The park also features the only two native mammals of New Zealand, the short and long tailed bat (Mystacina tuberculata and Chalinolobus tuberculatus). The Tongariro National Park also teems with insects like moths and wetas. Also present in the park, as well as the whole of New Zealand, are animals introduced by Europeans, such as black rats, stoats, cats, rabbits, hare, possums and red deer. The three volcanoes: snow-capped Ruapehu (left), conical Ngauruhoe (centre) and broad-domed Tongariro (right). The mountain summits are of great significance to the local Māori. The Tongariro National Park encircles the volcanoes of Tongariro, Ngauruhoe and Ruapehu, which hold great significance to the local Māori. Fearing exploitation of the mountains by European immigrants, Te Heuheu Tukino IV (Horonuku), the most significant chief of the Māori Ngati Tuwharetoa iwi (or clan), gifted the heart of the current national park, consisting of the peaks of Mount Tongariro, Mount Ngauruhoe, and parts of Mount Ruapehu, to The Crown on September 23, 1887, on condition that a protected area be established there. This 10.1 square miles (26.4 sq km) area was generally considered to be too small to establish a national park after the model of Yellowstone National Park in Wyoming (USA), and so further areas were bought. When the New Zealand Parliament passed the Tongariro National Park Act in October 1894, the park covered an area of about 97.34 square miles (252.13 km), but it took until 1907 to acquire the land. When the Act was renewed in 1922, the park area was extended to 226.56 square miles (586.8 sq km). Further extensions, especially Pihanga Scenic Reserve in 1975, enlarged the park to its current size of 307.33 square miles (795.98 sq km). The last modification to the Act was passed in 1980. Tongariro National Park has been under the control of the New Zealand Department of Conservation since the creation of the department in 1987. The first activities in the young Tongariro National Park were the construction of tourist huts at the beginning of the twentieth century. But it was not before opening of the railway in 1908 and the building of roads in the 1930s that a significant number of people visited the park. The second Tongariro National Park Act, in 1922, began some active conservation efforts, but it was not until 1931 that the first permanent park ranger began work. Road construction into Whakapapa valley had begun in the 1920s. The first ski hut was built in 1923 at an elevation of 1770 m, thereafter a road, and, in 1938, a ski lift in the area. This early tourist development explains the rather uncommon existence of a permanently inhabited village and fully developed ski area within a national park. The hotel Chateau Tongariro, which is still the center of Whakapapa today, was established in 1929. In the early twentieth century, park administrators introduced heather to the park, for grouse hunting. Grouse were never actually introduced, but the heather is sprawling, threatening the ecological system and endemic plants of the park. Efforts are being made to control the plant's spread, however complete eradication seems unlikely. The Tongariro Power Scheme has succeeded in harnessing the power of water with minimal impact on the environment. The system's design incorporated the goal of preserving and protecting the natural surroundings as much as possible. Its two powerhouses produce around seven percent of the country's electricity, while the outflows that feed into Lake Taupo add flexibility to the much older chain of eight hydroelectric dams along the Waikato River. It gathers water from the mountains of the central volcanic plateau, passes it through Rangipo (120MW) and Tokaanu (240MW) power stations, and releases it into Lake Taupo. The scheme taps a catchment area of more than 1,004 square miles (2600 sq km) and uses a series of lakes, canals and tunnels to take water to the two stations which typically generate 1400 GWh pa, about seven percent of the country's total electricity generation. The western diversion takes water from six rivers and streams from the Whakapapa River to the Whanganui River, into Lake Rotoaira via Lake Otamangakau. The Tokaanu power station is connected to Lake Rotoaira via a 3.7 mile (six km) tunnel through Mount Tihia. It also draws water from the Tongariro River via the Poutu tunnel and canal. On the eastern side of Mount Ruapehu, water is diverted from the Kaimanawa Ranges and headwaters of the Wahianoa River through a 12.5 mile (20 km) tunnel into the Rangipo dam. The 120MW Rangipo power station is 755 feet (230 m) below ground. Its turbines are located in a cavern cut from solid rock and lined with concrete. Genesis Energy has developed mitigation measures with stakeholders that aim to lessen the environmental effects of the Tongariro Power Scheme. Some of these measures include lake level management, ecological monitoring programs, and agreements with local iwi to establish a process for iwi involvement in environmental monitoring and access to information. The electricity generated at the Tongariro Power Scheme goes into the national grid. It is then distributed to residential, commercial and industrial customers throughout New Zealand. Ruapehu seen from Whakapapa Village, Tongariro National Park. This road climbs to Iwikau Village, which provides access to ski fields. The main activities within the park are hiking and climbing in summer, and skiing and snowboarding in winter. There is also opportunity for hunting, game fishing, mountain biking, horse riding, rafting and scenic flights. The most popular track in Tongariro National Park is the Tongariro Alpine Crossing. Most of the track is also part of the Tongariro Northern Circuit, a two to four day tour, which is one of New Zealand's nine Great Walks. Side trips to the summits of Mount Tongariro and Mount Ngauruhoe are possible on these tracks. Another route is the three to six day Round the Mountain Track around Mount Ruapehu. Besides these, there are numerous shorter tracks appropriate for day tramps. With this track net, three camp sites, two emergency shelters, nine public and four private huts and the facilities in Whakapapa, the park is well developed for tourism. These tracks also serve as winter routes, as well as the track to the summit of Mount Ruapehu. Rock-climbing is also an option. Snow season is from the end of July to early November. The biggest ski area, also called Whakapapa, is on the western slope of Mount Ruapehu. It has 15 lifts, covering an area of 21 square miles (55 sq km). Abutting the ski field are 47 ski club huts; most of them also accommodate non-club members. The next settlement is on the bottom, in Whakapapa. A slightly smaller ski field called Turoa is on the south-western slope. Though it has only nine lifts, the skiing area, of 19.3 sq mi (50 sq km), is almost as large as Whakapapas. There is no accommodation at the ski field; the nearest town is Ohakune. These two ski fields came under common management in the year 2000. Ski passes can be used on both fields, and a lift or run from one field to the other is planned. Beside these major ski fields, there are also the Tukino ski area, privately run by the Desert Alpine Ski Club, and the Aorangi Ski Club on the south-eastern slope. It has two T-bar lifts, and covers about three-quarters of a square miles (1.9 sq km). 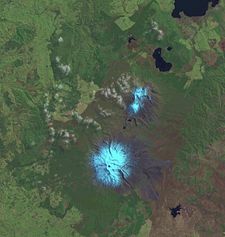 ↑ New Zealand Department of Conservation Tongariro weather Retrieved June 4, 2008. ↑ Rough Guides The Tongariro Power Scheme Retrieved June 4, 2008. Atkinson, I. A. E. 1981. Vegetation map of Tongariro National Park, North Island, New Zealand: 1:50000. Wellington: New Zealand Dept. of Scientific and Industrial Research. Beetham, George, and J. P. Maxwell. 1926. The First ascent of Mount Ruapehu, New Zealand: and a holiday joint to mounts Raupehu, Tongariro and Ngauruhoe. London: Harrison and Sons. Cowan, James. 1927. The Tongariro National Park, New Zealand - Its topography, geology, alpine and volcanic features, history and Maori folk-lore. Ferguson & Osborn Ltd for The Tongariro National park Board. National Park Village Business Association. Tongariro & Whanganui National Park Retrieved June 4, 2008. 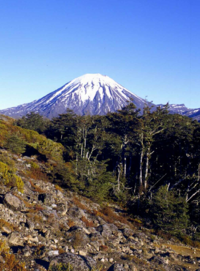 History of "Tongariro National Park"
This page was last modified on 11 December 2015, at 17:07.